What Can We Learn From The New York Fed’s Underlying Inflation Gauge? Working on examples for a class, I stumbled upon one with implications for market participants. 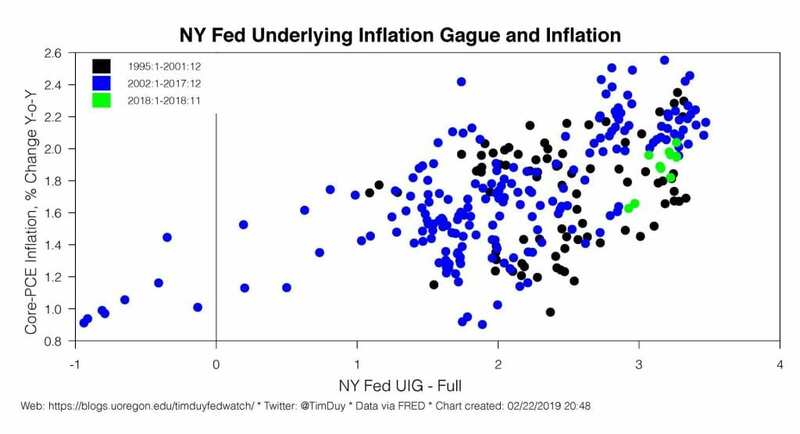 Specifically, what has the New York Federal Reserve’s Underlying Inflation Gauge (UIG) been telling us? The answer is somewhat surprising. It does provide new information about the path of core-inflation. Still, even at its height it wasn’t predictive of any worrisome inflation. There are two interpretations. One is that you ignore the UIG, the other is that you embrace the predictions of low inflation. I pick the latter interpretation. The New York Fed UIG is an effort to capture the underlying trend in inflation. 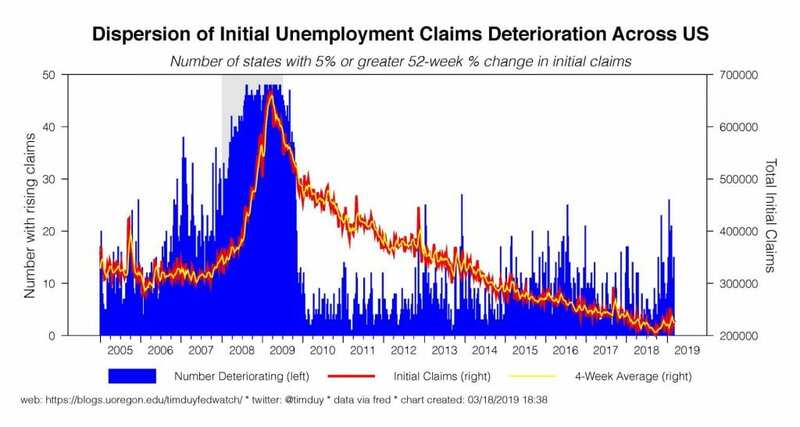 An attractive feature of the UIG is that its construction utilizes a wide array of financial and economic variables; The “full-data-set” version is based on 346 monthly, weekly, and daily series. 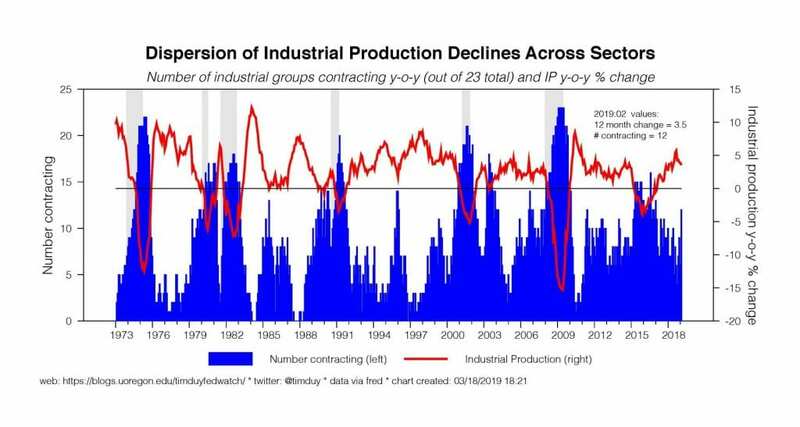 This allows it to capture a number of factors such as, for example, tighter labor markets that may influence the path of core inflation. 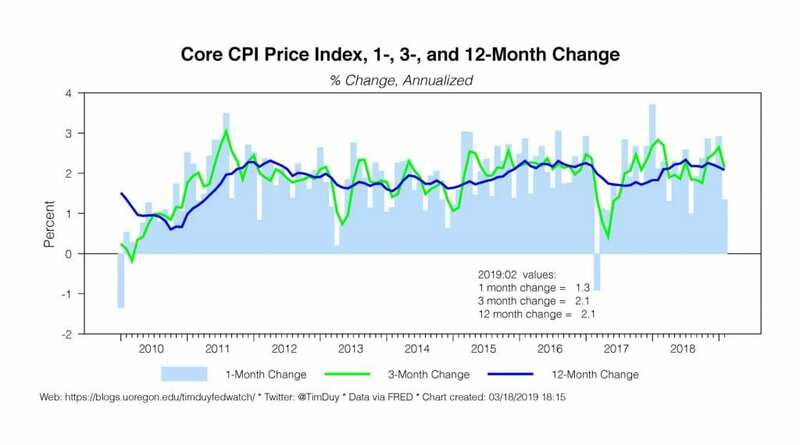 The objective is to add information to our traditional measures of core-inflation as those measures arguably exclude important information that might shape our inflation forecast. With this in mind, I set out to understand a bit more about the dynamics between the UIG and inflation. 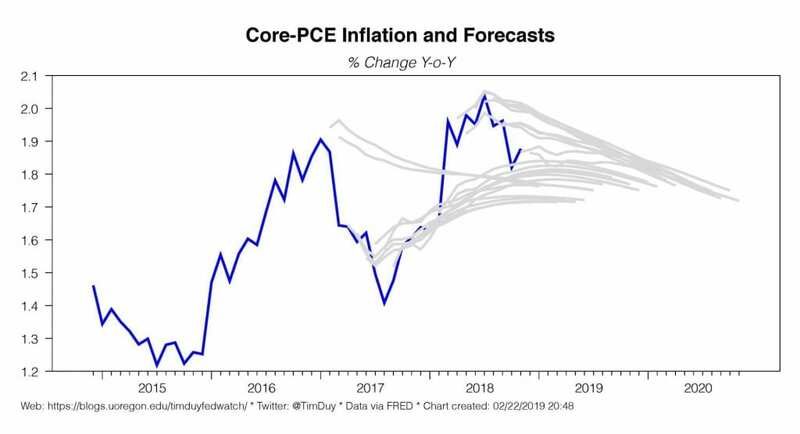 While the UIG is presented along with year-over-year core CPI inflation, I focus on year-over-year core PCE inflation because the latter is the Fed’s preferred inflation measure (technically, the Fed targets headline inflation but use core as a predictor of the likely path of headline inflation). I also use the “full-data-set” version of the UIG as it received the most press last year and I am interested in the importance of the wider range of variables in predicting inflation. Visually, the turning points of the UIG correspond to turning points of core-inflation. Moreover, high values of the UIG have corresponded to inflation rates in excess of the Fed’s 2% target. This is more easily seen in a scatterplot. What I want to know is a.) does a change in the UIG predict a change in core-inflation and b.) what does the UIG say about the inflation forecast? To get at these issues I set up a simple two-variable vector autoregression with six lags. The Granger causality tests indicate that the UIG and inflation both have an impact on inflation but inflation does not have an impact on the UIG. 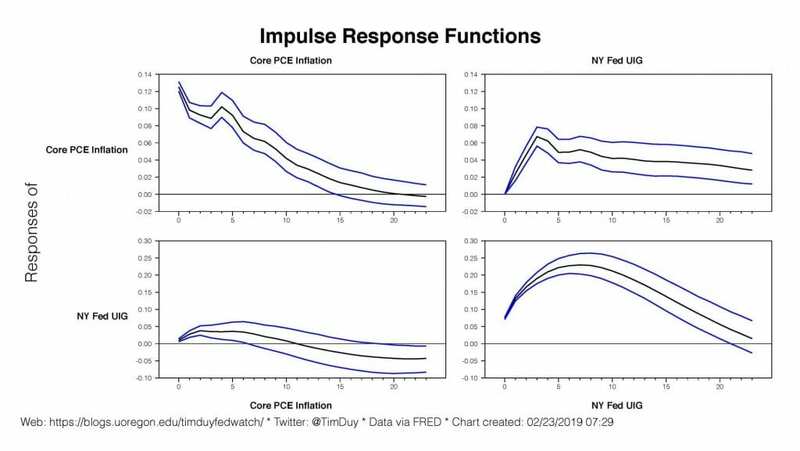 That suggests a shock to the UIG will have an impact on inflation but not vice-versa, which is what the impulse response function show. 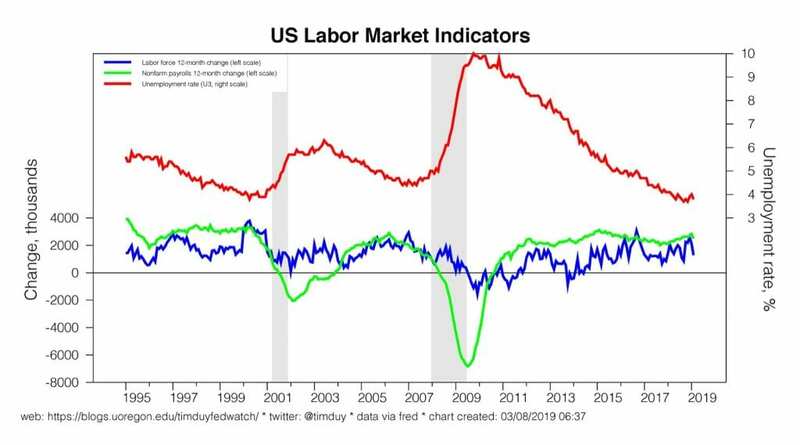 Roughly, a 0.07 percentage point shock to the UIG will be translated into an equal shock to core-inflation after three months (right hand charts). Moreover, the impact on core-inflation is fairly persistent (upper right chart). 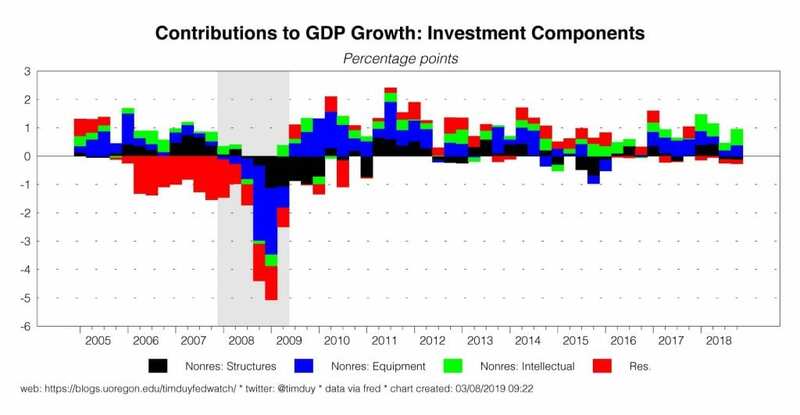 Shocks to core-inflation are not persistent and dissipate over the next twelve months (upper left chart) while having very little impact on the UIG (lower left chart). These basic results are not very sensitive to the choice of lag length, but lag lengths beyond 12 months tend to result in models where the cycles overrun each other and are not particularly instructive. I find these results reassuring in that they suggest the UIG does capture factors that have a persistent impact on core-inflation. That said, has the magnitude of shocks been sufficient to heighten inflation concerns? To get at that question, I compute the 24-month inflation forecasts from the model for each month beginning with 2017:1 and ending 2018:11 (using recursive regressions that re-estimate the model each month). Those forecasts all point toward inflation settling into a range of 1.7-1.8%. In other words, adding the UIG to the inflation forecast has indicated for the past two year that inflation will fall short of the Fed’s target. 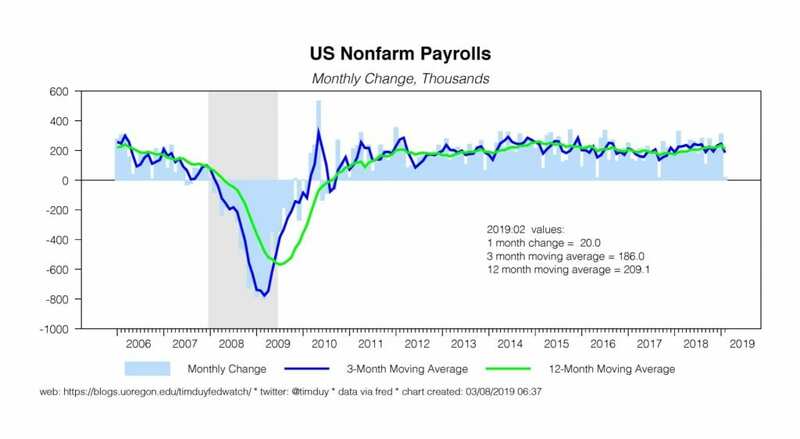 I think these results point toward the strength of the mean reverting properties of inflation in recent years as inflation expectations have become more entrenched and the Phillips curve less pronounced. 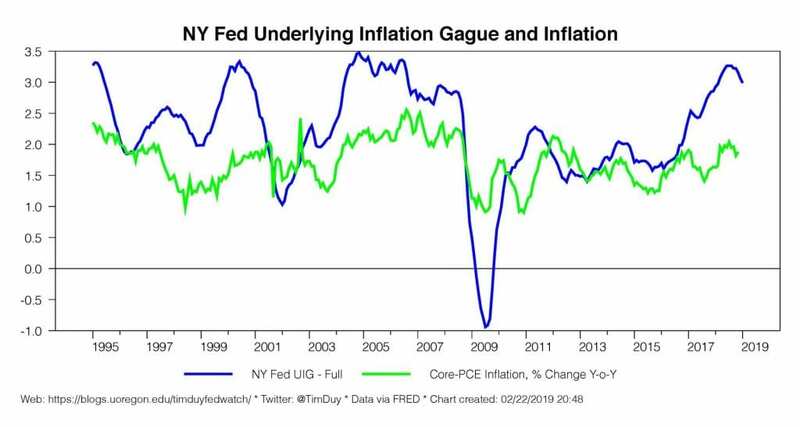 Bottom Line: The New York Fed UIG appears to provide new information about the direction of inflation but that information for the past two years has indicated inflation below the Fed’s target. 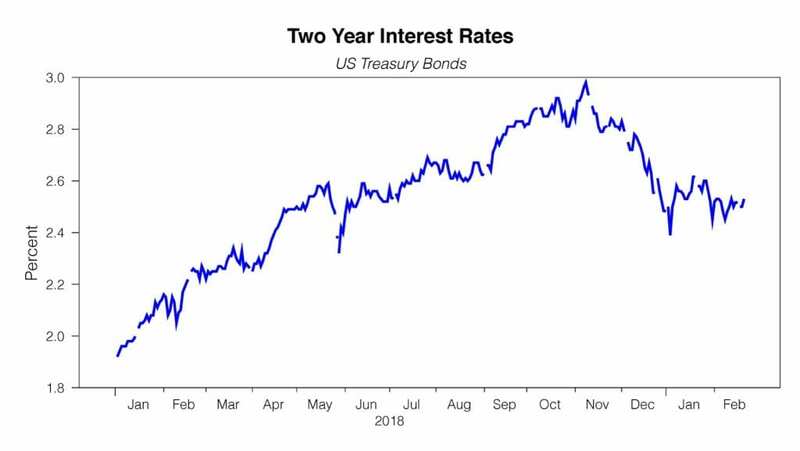 There is one very important rule that all market participants should keep at the forefront of their minds: The Federal Reserve wants to kill your recession call. As is often the case, one could linger for hours over the minutes of the Fed meetings, pulling out interesting bits and pieces to chew on. This one is no exception, but the short story in the January minutes is that the Fed was concerned enough about the outlook to shift to its current “patient” stance, but not so worried that they were contemplating a rate cut in the year ahead. They are also closer to ending the balance sheet reduction; I expect they will slow the pace they are reducing the balance sheet within the next two meetings with an eye toward ending entirely by the end of the year. Participants commented that, in light of the Committee’s longstanding plan to hold primarily Treasury securities in the long run, it would be appropriate once asset redemptions end to reinvest most, if not all, principal payments received from agency MBS in Treasury securities. 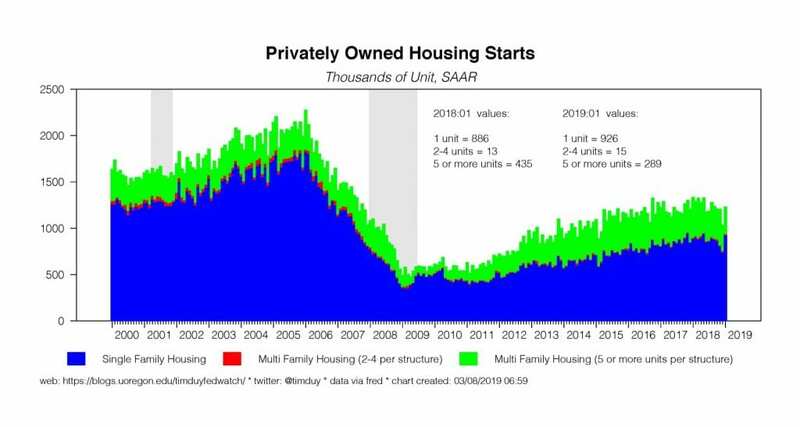 In other words, they will eventually find themselves once again buying Treasuries to offset continued reduction in their mortgage holdings as they work to exit the housing business. Participants noted that growth of business fixed investment had moderated from its rapid pace earlier last year. Participants continued to view inflation near the Committee’s symmetric 2 percent objective as the most likely outcome. 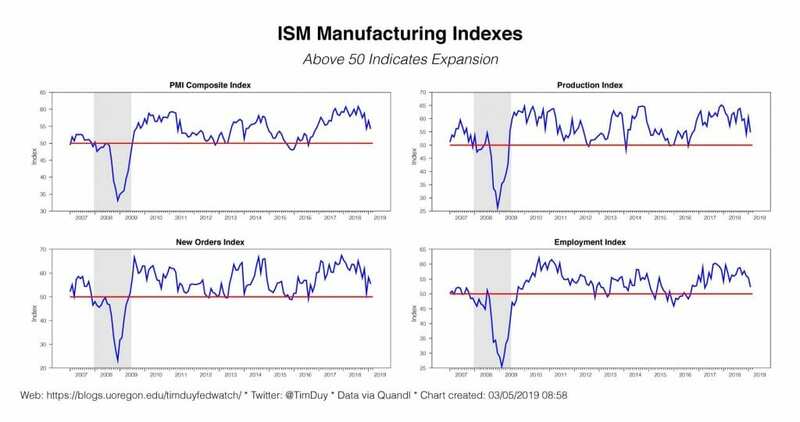 They took a fairly benign view of falling market-based measures of inflation compensation, favoring the interpretation that this was less about falling inflation expectations and more about declining risk premiums and a greater risk of downside to the inflation forecast. Stable survey measures of inflation expectations supported this view. Since then, however, the University of Michigan longer-run inflation measure slipped to 2.3%. 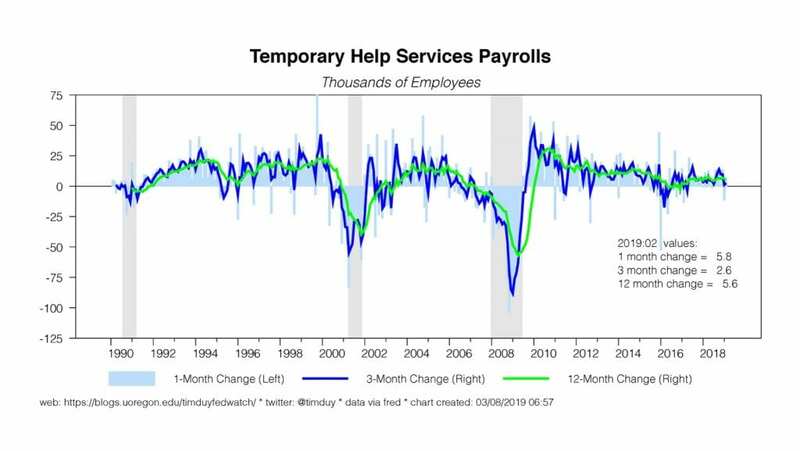 Most interesting is that series has not begun to edge higher despite a period of unemployment that is supposedly persistently below its natural rate. 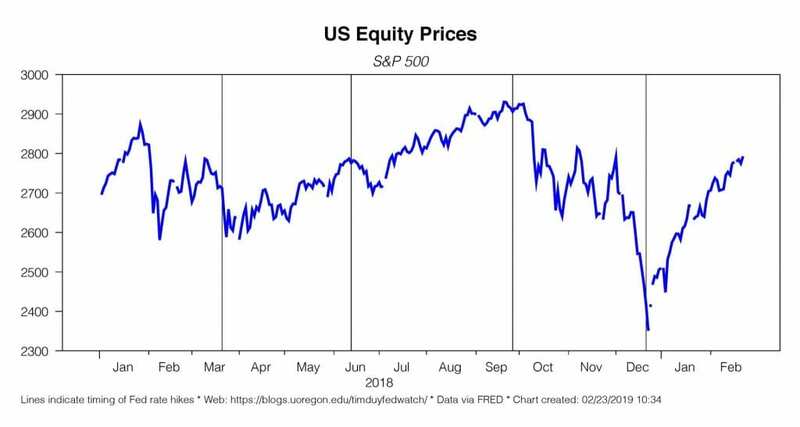 Among those participants who commented on financial stability, a number expressed concerns about the elevated financial market volatility and the apparent decline in investors’ willingness to bear risk that occurred toward the end of last year. 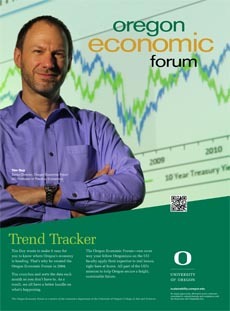 Participants observed that since then, the economic outlook had become more uncertain. Financial market volatility had remained elevated over the intermeeting period, and, despite some easing since the December FOMC meeting, overall financial conditions had tightened since September. 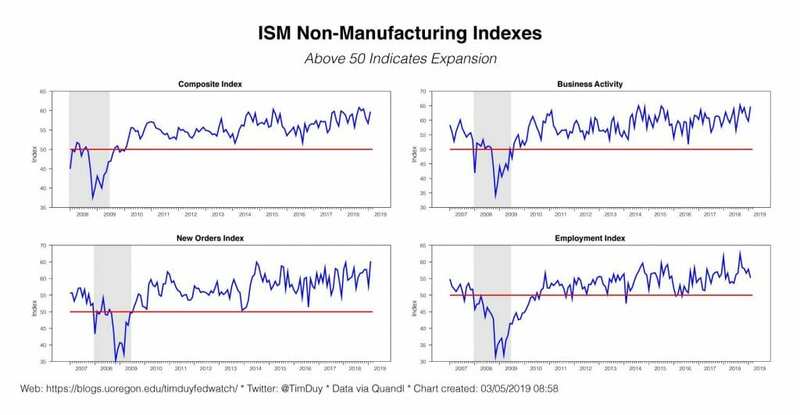 In addition, the global economy had continued to record slower growth, and consumer and business sentiment had deteriorated. The government policy environment, including trade negotiations and the recent partial federal government shutdown, was also seen as a factor contributing to uncertainty about the economic outlook. They subsequently concluded that they should hold rates constant and signal they would be patient with respect to future policy changes. 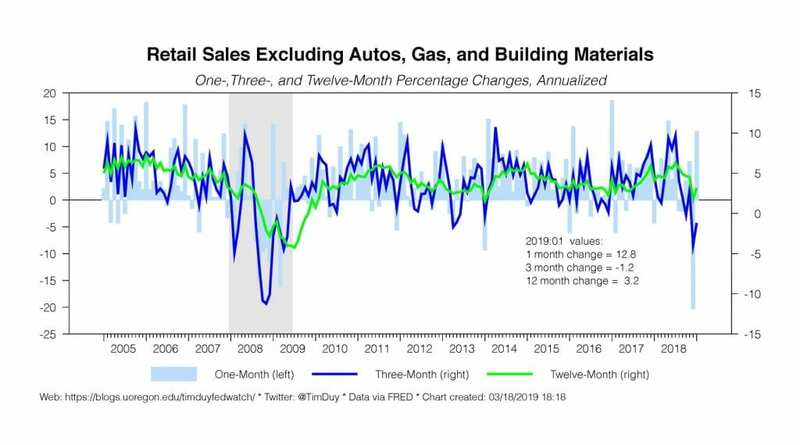 Interestingly, I would argue that most of these factors were present at the December policy meeting, which would explain why markets puked in the wake of that decision to hike rates and signal more rate hikes to come. 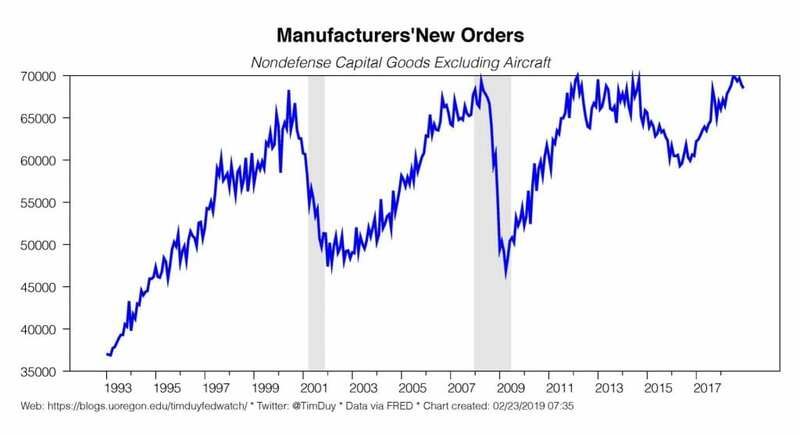 The Fed was then less willing to see what everyone else saw. Many participants suggested that it was not yet clear what adjustments to the target range for the federal funds rate may be appropriate later this year; several of these participants argued that rate increases might prove necessary only if inflation outcomes were higher than in their baseline outlook. 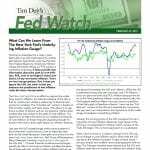 Several other participants indicated that, if the economy evolved as they expected, they would view it as appropriate to raise the target range for the federal funds rate later this year. 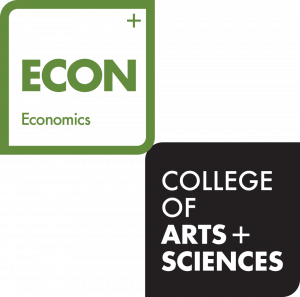 A few participants expressed concerns that in the current environment of increased uncertainty, the policy rate projections prepared as part of the Summary of Economic Projections (SEP) do not accurately convey the Committee’s policy outlook. These participants were concerned that, although the individual participants’ projections for the federal funds rate in the SEP reflect their individual views of the appropriate path for the policy rate conditional on the evolution of the economic outlook, at times the public had misinterpreted the median or central tendency of those projections as representing the consensus view of the Committee or as suggesting that policy was on a preset course. However, some other participants noted that the policy rate projections in the SEP are a valuable component of the overall information provided about the monetary policy outlook. The ongoing debate at the Fed. Does the dot plot help or hurt? 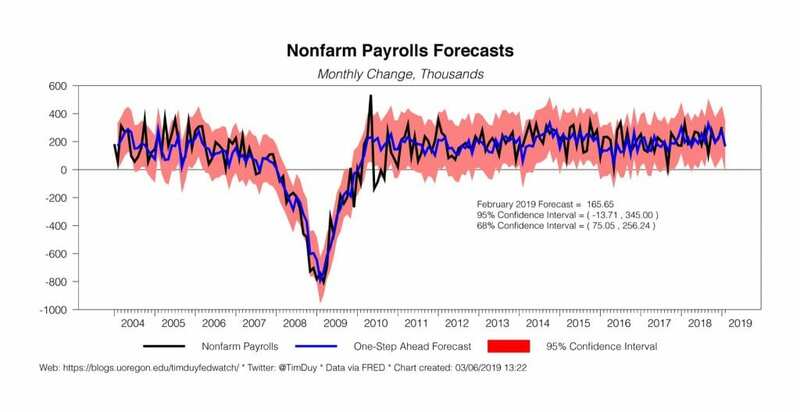 The Fed is having a hard time convincing market participants that the dot plot median is not a consensus forecast and that any of the individual forecasts are much more uncertain than commonly believed. 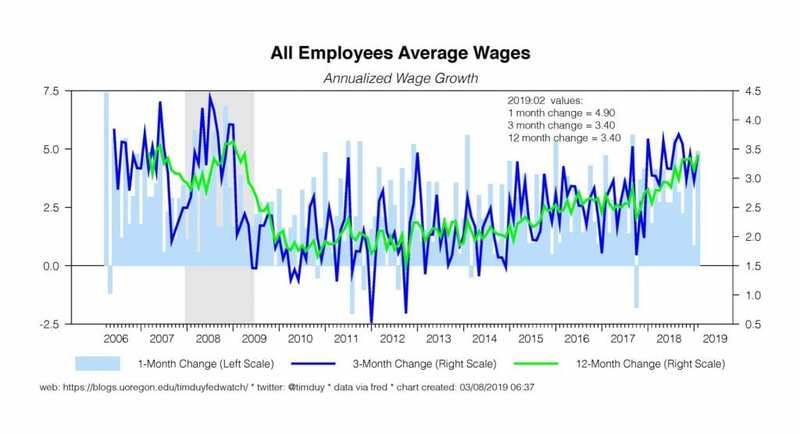 This was particularly an issue in December when the median dot anticipated another two rate hikes in 2019 after the Fed pushed through what market participants already considered an ill-advised rate hike at that meeting. The Fed argues that was a forecast, not a promise. This and similar dynamics have been an ongoing issue. In my opinion, the Fed’s models make the dot plot inherently hawkish, which arguably sets expectations such that policy is less accommodative than the Fed believes. All that said, many FOMC participants still find value in the dot plot in that it conveys the Fed’s reaction function. The challenge is finding a new version of the dot plot that retains this communications element while losing the problematic elements. 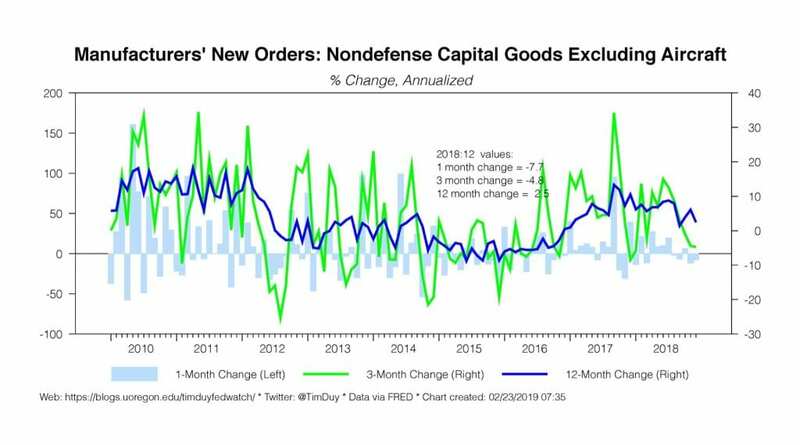 Bottom Line: Policy on hold through mid-year at least, the Fed still retains a modestly hawkish internal bias, the balance sheet reduction will soon be over, and the Fed still doesn’t know exactly what to do with the dot plot.